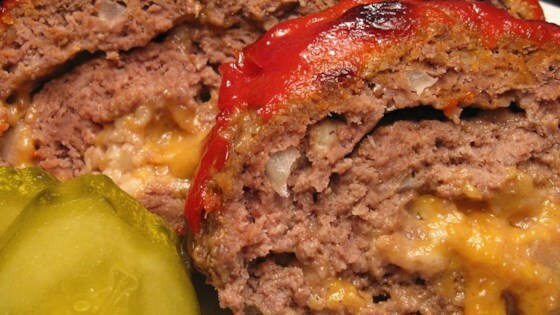 "This meatloaf is extremely juicy, and the potential variety of different flavors is as big as your imagination. I've done American cheese with ketchup and mustard on top and served with dill pickle chips. Another one might be Swiss cheese and mushroom topping." In a large bowl, combine the beef, bread crumbs, onion, eggs, salt and pepper, and mix well. Pat out meat mixture into a 14x18 inch rectangle on a piece of wax paper. Spread cheese over the meat, leaving a 3/4 inch border around the edges. Roll up jelly roll fashion to enclose the filling and form a pinwheel loaf. Press beef in on both ends to enclose the cheese. Place in a 10x15 inch baking dish. Bake in the preheated oven 1 hour, or until internal temperature reaches 160 degrees F (70 degrees C). I love the idea of this meatloaf but it was so salty I threw out the leftovers. I put less than the amount of salt it called for. Did anyone else have this problem? I am not a meatloaf fan but this was very good. Didn't taste like meatloaf. The taste was very good. I had a hard time rolling it like a jelly roll. I will make it again.